Like-Kind Exchange Corner: Some Additional Thoughts on the Same Taxpayer Requirement of Code Secs. 1031 and 1033: Spouses and Trusts. Business Law Today. Volume 11, Number 3 – January/February 2002. Mary B. Foster. 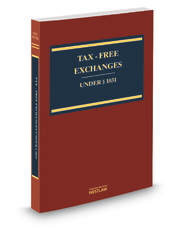 American Bar Association – Tax Section: Joint Report on § 1031 Open Issues Involving Partnerships. Tax Management Memorandum.